It is very difficult to keep count of the shots that you've fired under stress. If you have fired your rifle and are unsure whether you are closer to full or empty, maybe it's time for a Tactical Reload. 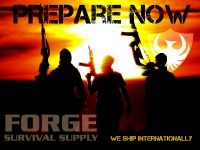 Cover is better but concealment may be all you have. The idea is not to be exposed while executing a magazine change. 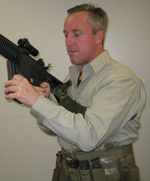 Obtain a fresh magazine from your equipment. 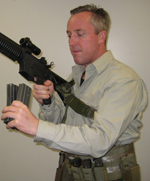 It is a common mistake to remove the partial magazine before retrieving the new one. Don't do this. Eject the partial magazine. There are many different ways to manipulate the magazine exchange. The two most common grips are the Side-by-Side Grip and the L Grip (covered below). 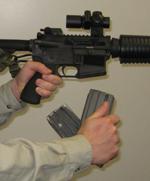 You will have to find the way that works best with your hand size vs. magazine size. Insert the fresh magazine. 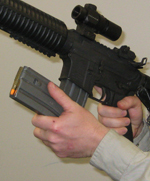 Give the magazine a tug to ensure that it is seated properly. Stow the partial magazine in a location where it can be reached. Dump bags are good for this unless you are also saving empties. Digging through the dump pouch for that last partial magazine is a recipe for frustration. 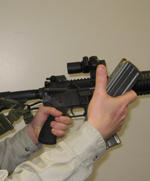 With a firm over handed grip around the full magazine grasp the partial magazine using the pointer finger as a spacer. 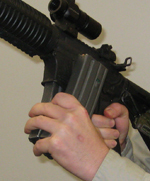 With a firm over handed grip around the full magazine cup the base of the magazine that is in the weapon. Once the old magazine is released, rotate the new one into place. There is no easy way to perform this maneuver. 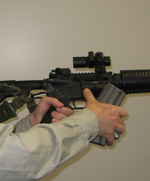 Shooters will need to use a modified L Grip. The key to the whole procedure is the right thumb. Press the magazine release as you are clamping the new magazine against the partial magazine. Your hold on the two magazines will be tricky until you get the hang of it. Pull the old magazine out and rotate the new magazine into position. After you've inserted the new magazine, don't forget to give the new magazine a tug to ensure that it has been properly seated.